DENVER — Colin Wilson stepped up with his team banged up. It was an opportune time for the Colorado Avalanche forward get back on track. 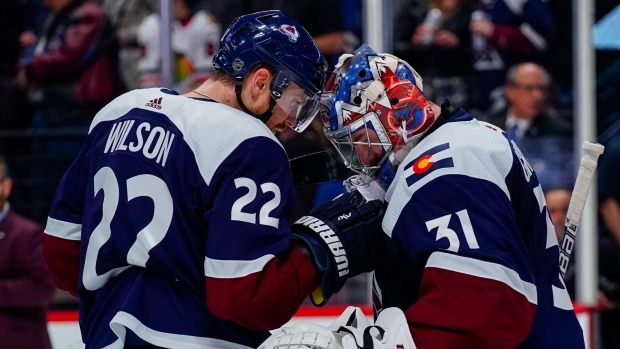 Wilson scored his first goal in more than a month, Philipp Grubauer stopped 29 shots and the playoff-chasing Avalanche earned their fourth straight win by holding off the Chicago Blackhawks 4-2 on Saturday. J.T. Compher and Sven Andrighetto also scored. Derick Brassard added an empty-netter for an Avalanche team moved into the second wild card spot in the Western Conference, a point ahead of Minnesota and Arizona. The Wild lost 5-1 to Carolina later Saturday. "Big two points," Wilson said. "It had a playoff atmosphere to it." Colorado had an array of forwards pitch in with All-Star Mikko Rantanen missing the game with an upper-body injury. They're already without captain Gabriel Landeskog, who's sidelined with an upper-body ailment. Wilson delivered his first goal since Feb. 7. Grubauer did his part by keeping up his torrid play and winning his fourth straight start. The chants of "Gruuuu" grew louder with every save he registered. "Not one of my better ones, but I'll take it," Grubauer said. Jonathan Toews and Erik Gustafsson had goals for Chicago, while Corey Crawford stopped 21 shots. The loss was a blow for the Blackhawks, who are making a late charge but are now six points behind Colorado. "From here on in, every game is a must-win," Chicago defenceman Duncan Keith said. "We have to have our best game of the year going forward." The two teams face each other again Sunday as part of a back-to-back, home-and-home set. Andrighetto's tip-in goal 1:26 into the third period gave the Avalanche a 3-1 lead. The officials took a look on replay to see if Andrighetto knocked it in with a high stick or with a glove, but quickly confirmed the goal. "We played pretty solid for the most part," Crawford said. "It's still not good enough. We've got to bring a little bit more." Gustafsson scored with 7:56 remaining on a shot from the blue line to make it 3-2. But Brassard wrapped things up on an empty-net goal with 2:20 left. There was a scary moment in the second period when defenceman Tyson Barrie was hit near the eye by the stick of David Kampf with Colorado on the power play. Barrie quickly skated toward the locker room holding his face. The Avalanche capitalized on the two-man advantage as Wilson made it 2-1 on a pass from Alexander Kerfoot, who finished with two assists. Moments later, Barrie returned with a bandage over his cut. Colorado took the early lead in the second period after Compher tipped in a shot. It was the third goal this season against Chicago for the Northbrook, Illinois, native. That was also a sign of things to come with the Avs being aggressive around the net. "It's hard to score those goals, because you have to pay a price to be there but it's easy because everyone can do it," Blackhawks coach Jeremy Colliton said. "They got a couple that way. We didn't generate enough offensively. So that's frustrating." Asked if it's an unwillingness to do the dirty work around the net, Colliton responded: "Sometimes we do it. Clearly it's an area we've got to get better at." NOTES: Blackhawks C Dylan Sikura had an assist. ... Zadorov made a young fan's day in pregame by giving her a hockey stick as she sat in the first row. ... NHL referee Brad Watson officiated his 1,393rd and final regular-season game Saturday. The players skated over and congratulated him after the game. ... Rantanen was hurt Thursday when he was hit into the boards in a win at Dallas. ... Landeskog was expected to miss 4-to-6 weeks when he went out earlier this month. He's starting to shoot pucks and coach Jared Bednar said he could be back earlier than expected. ... Avs F Nathan MacKinnon had five shots to bring his season total to 336. That's the second-most in franchise history behind Joe Sakic, who had 339 shots in 1995-96. Same two teams meet Sunday in Chicago.